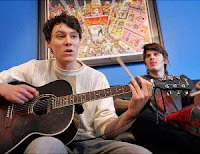 That's the official video for the song Swimming Pool by the band The Front Bottoms. The Front Bottoms are a Folk-Punk two piece based out of Jersey that released their self-titled debut album this month. Their unique, but completely approachable sound, has kept me listening to this album again and again. Being a two piece, it's going to be rather simple and stripped down, or so you might think. The fast drumming from Mathew Uychich along with the acoustic-power-chord guitar and vocals of Brian Sella are a perfect fit with the lyrical storytelling that I'm thinking everyone can relate to. There are various horns and bells and other instrumentation throughout the album, but I wonder if they leave out this additional embellishment when they tour. This band sounds so fresh to me, it's hard for me to identify the bands influences but I'd be willing to bet that The Mountain Goats would be high on their list. This album is fantastic. If you like the video and the song, I really think you will be completely blown away by the rest of the album. Purchase it below!